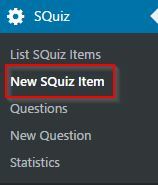 Start with New Squiz Item from the SQuiz menu. decide if you want to randomize questions or have a time limit. Review at the and and a passing score is obviously not suitable. I don’t know if a time limit makes sense because the survey will end automatically if time has elapsed. After that you have to save the survey otherwise you cannot add questions. You should have already created some questions for your survey , otherwise you must do that now. 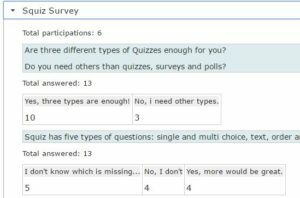 You can use the same questions as for the quizzes and polls. Difference will be in evaluation. No answer will be considered as correct, every answer will be counted and listed aggregated in the evaluation. 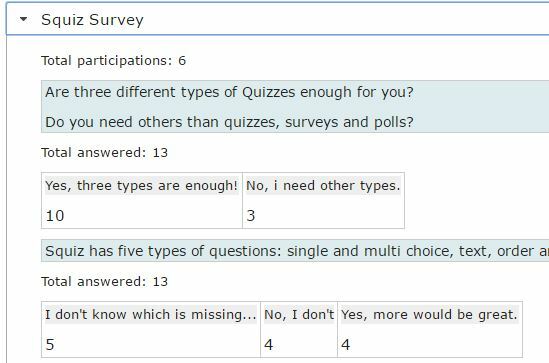 Surveys are different from quizzes because there are no correct answers. To get Questions were the user can choose more than one answer you have to mark all possible answers as correct. To get a single choice question (such as true / false) leave all correct checkboxes unchecked – the user can only select one answer. Further information about adding answers here. Add some text to say goodbye to your visitor or let him know some statistics. Use the placeholder as described on top of this box. This is an example for a quiz ending but you can use the placeholders similar to that.